Have you been yearning for a vacation to the South Pacific? This summer, the Paul Tavai-Latta Polynesian Dancers & Co of Vancouver is bringing the island vibes to Canada Day Drumming with authentic Tahitian drumming and Polynesian dancing performances! Get yourself a young coconut, pull out your sun glasses and Hawaiian shirt, join us this July 1 at Vancouver’s Creekside Park and get ready to enjoy the show! 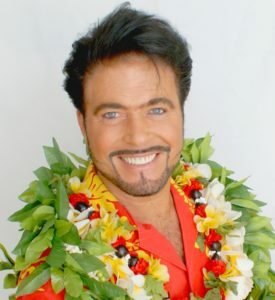 With over 50 years of performing and 47 years of teaching authentic Polynesian & Island dance, drums, music, culture, language, geography and customs, Paul Tavai-Latta is one of the most sought after educators of Ma’ohi (Polynesian) studies in Canada. Raised, schooled and trained in the South Pacific, throughout Tahiti, Mo’orea, Raiate’a, Bora Bora, Fiji, New Zealand, Aitutaki eventually settling in Rarotonga, Cook Islands for many years, and then later Hawai’i This early introduction to the Polynesian way of life fostered Paul’s life-long passion for all that is Polynesian that continues to this very day. Japan, Las Vegas, Europe, Mexico, Rarotonga, Tahiti & Honolulu. The Paul Tavai-Latta Polynesian Dancers & Co of Vancouver offers over 15 different professional and non-professional Polynesian, Middle Eastern & Variety production shows both locally and worldwide. Authentic Tahitian drumming is one of the oldest and rarest in the Pacific, which is native to Tahiti and French Polynesia. A ʻupaʻupa (band of drummers) group consists of a variety of drummers playing a variety of drums, of all sizes, creating a range of sounds, with each drum having its own “notes” and its own job! The drums have a hierarchy system. Drummers start on the base drum – Pahu, which is the lead drum– originally covered in Human skin – now Calf! This most important drum provides the basic beat, and speed for each rhythm. 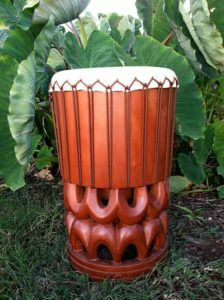 This is also the only drum that the very few female drummers in Tahiti play. The second drum in the rank is the lead “Log” drum . It is called the To’ere Arata’i one of the main sounds associated with Tahiti and is the most challenging to play. 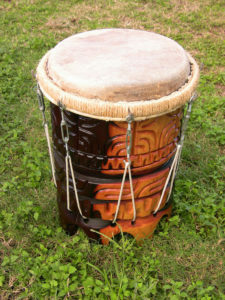 The third drum, which is an optional drum in the rank, is the Fa’atete drum. It is a single membrane which can be struck with hands or drum sticks. It is usually made out of coconut tree wood with sharkskin stretched across. 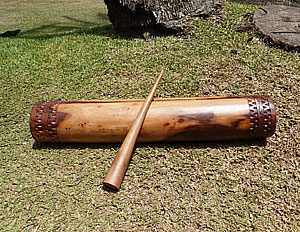 It plays a more complex rhythm than the Pahu. It has a high tom sound with less resonance.